Have you ever had a day that started wrong and continued a downward spiral until evening? Maybe you haven’t started with your focus in the right place. Many times you’re thinking about schedules and trying to work through the day before it starts. Your day can take off much stronger and end with peace in your heart when you begin with God’s word. You wake up and don’t really want to start your day. It happens to the best of us—yet this is your day in the Lord, you might not get another one…don’t miss it! Your heart feels weary from the testing and trials in your life. It’s easy to fall into a pity party. Yet the Lord is still working on your behalf and you must gird yourself up to trust in Him regardless of your circumstances. You feel weak and without the strength to keep pushing yourself. Rely on God’s great power and ability to get you going. Pray and receive His strength to make it through the day. You want the assurance that God is going to keep your loved ones during the day. Pray this scripture to build your confidence in the Lord to extend His protection and care. You are tempted with many things; however, it’s your desire to overcome temptation. The Lord knows exactly what you struggle with and provides the opportunity for you to step out of it. Listen carefully to the promptings of the Holy Spirit for clarity and direction. You wake up with many options in your day; however, you have no idea of which way to go. God is in control regardless of your choices; therefore, seek out His direction and walk in faith every day. You have a situation in your life that is beyond your human ability to figure out. Perhaps God wants you to stop trying to figure it out in your flesh and rely on the Spirit of God to give insight. You may struggle with feeling good about yourself. The best remedy for morning blues is an old-fashioned time of worship and praise for the mighty God you serve. Rejoice in the Lord with song or dance will drive the rest of your day positively. You feel like you’re under spiritual attack. Attacks from our enemy can come out of nowhere; therefore, we must be prepared with every piece of spiritual armor to stand throughout the day. Satan is already defeated; therefore, rest in your Father’s comfort and care. Your boss is unfair and unjust towards you. Many times it can drive you to great discouragement and despair. Your Heavenly Father is greater than your boss. Pay close attention to your behavior as you ultimately work for God and not man. The Lord always rewards good work. Your thoughts trouble you all the time. God’s word is effective for bringing thoughts under control of the Lord Jesus. Keep praying this scripture in faith and trust in the Lord to give you victory over a troubled mind. You know that God loves you, but still struggle every day with feeling unworthy. Every morning the love and mercy of God hovers over you waiting for the first moment of wakefulness. Trust in His faithfulness to restore every hurtful word and action in your life. The moment you step through the door at work, you may be immediately assaulted by foul language and vulgarity. Yet when you show up…God shows up. Let the light of Christ shine through your words, actions, and attitude in the darkness of unbelief. You feel hopeless because there’s so much despair in the world. Remember that you are in the world and not of the world. The Holy Spirit within you can stir up hope if you will believe in the sovereignty of God in spite of the wickedness of the world. Your best start to your day is in the Word of God! Take one a day for a month—repeating the scriptures bimonthly and make them your morning prayers. You will find yourself living above the troubles of the day because God’s word will sustain you. Thank you for these comforting scriptures. 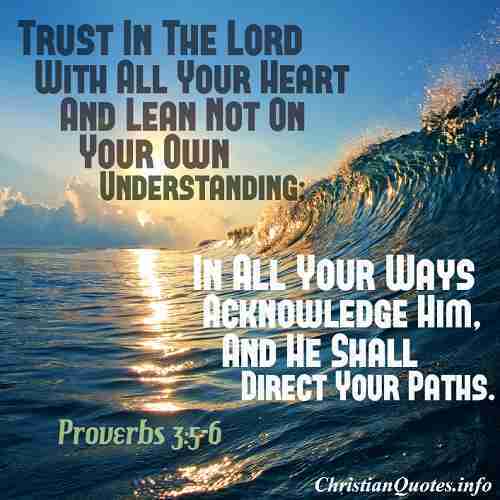 Proverbs 3:5-6 inspired me to realize that we are not alone in our daily challenges in life. There will always be someone looking over us. All it takes is for us to communicate with him through prayers. Very nice. However CHRIST’S name is not Jesus. The letter j has only been in existence for about 400 years. So impossible to be his name. You will find no j’s in a 1611 King James bible. The names are important. GOD’S name is not GOD or LORD. Those are titles not names. GOD gave his name TO Moses in Exodus 3:14. HEAVENLY FATHERS name in Engilsh is I AM, in ancient Hebrew it’s AHAYAH. CHRIST’S name is YASHAYA MEANING my savior. Thank you Michael. I don’t see anyone in this article saying that “Christ” is Jesus’ last name. The letter “J” is used for “Y” in Hebrew so the letter “J” not being around since recently doesn’t detract from Jesus’ name. You said “Christ” is not Jesus’ name but then you use it as a name when you wrote, “CHRIST’S name is YASHAYA MEANING my savior” so am I missing something sir? We can’t use it but you can? Can you clear this up for me sir? Am always inspired when I read these texts, turning to the scriptures I always read them and God reveals to more and more. Be blessed. JESUS FELLOWSHIP CHURCH, MBALE – UGANDA. I thank you for these scriptures to start my day. However the Psalm 42:5 is not correct. I looked it up and that is not what is written. It’s, “As a deer pants for water…” I would like to know what the real scripture is. Hello Lynn. You are right. The correct verse is Psalm 42:1 and it has been corrected, so Psalm 42:1 is the verse about the deer panting. Such comforting scriptures to start my day. Thank you Lord for your words of comfort. Previous post: Why Are Christians Called To Be Salt and Light?